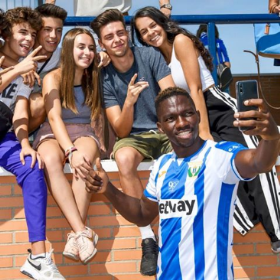 Chelsea loanee Kenneth Omeruo is poised to make his La Liga debut this evening in CD Leganés' clash with Athletic Club at the San Mamés Barria (Bilbao). Manager of Los Pepineros, ‎Mauricio Pellegrino, named Omeruo in a 20-man traveling party to Bilbao on Sunday, four days after his season-long loan signing was confirmed by the club. If the central defender is given a run-out, he will overtake ex-Real Betis winger Finidi George as the 22nd youngest Nigerian player to debut in the Spanish topflight, aged 24 years 10 months 3 days. Finidi was 25 years 4 months 17 days when he made his maiden league appearance in Spain for Betis in their 3-0 win over Athletic Bilbao on September 1, 1996, in which he opened his account after 13 minutes. Nigeria's youngest ever player to feature in the Spanish top-flight, Isaac Success, was 18 years 7 months 24 days when he made his La Liga debut against Elche on August 31, 2014.